Conor Oberst And The Mystic Valley Band In Concert Best known as the prolific and gifted frontman for the country-rock band Bright Eyes, Oberst ventured out on his own this summer. He released his first solo album in more than a decade: an eponymous sketchbook of introspective folk and rock, steeped in Americana. 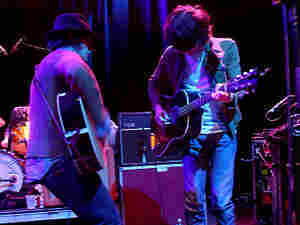 The new collection of songs are the centerpiece of a full concert by Oberst and his backing group, The Mystic Valley Band, recorded live from the 9:30 Club in Washington, D.C.
Conor Oberst spent the past decade making a name for himself as the youthful, quivery-voiced frontman for the arty folk-rock band Bright Eyes. But from the moment he took the stage at Washington, DC's 9:30 Club, it was clear he'd put that persona behind him, at least for now. Slightly older and more confident, Oberst offered a loose mix of material from his new, self-titled solo album, with the help of the Mystic Valley Band — a group of close, longtime friends Oberst assembled for the CD and tour. Wearing a black fedora and cuffed pants, Oberst sang with a more matured voice and a little swagger. He and the band gave an hour and a half performance for the sold-out crowd, working through Oberst's new solo album, along with a handful of songs by other band members, including "Reason Number 1" by drummer Jason Boesel, "Sundown" by guitarist Nik Freitas, and "Air Mattress" by guitarist Taylor Hollingsworth. The group avoided any Bright Eyes material all together. Although Bright Eyes has essentially been a solo project for Conor Oberst in all but name, the Omaha, Neb. native decided to abandon the moniker he'd performed under since his teens for his latest CD, an eponymous sketchbook of introspective folk and rock, steeped in Americana. He also chose to work with a different producer and backing band. Conor Oberst is the first album in several years Oberst recorded without longtime producer and multi-instrumentalist Mike Mogis. "Since (Mike) didn't play on it, it didn't seem right to call it a Bright Eyes project," says Oberst, in an interview with World Cafe's Michaela Majoun. "I was in charge of this record. And my standards are quite a bit lower than (Mike Mogis'). I think you can hear that. I like the performance to be right. That's what I base my decisions on. I'm not as neurotic about getting the tones to be a certain way. I just check to make sure it got recorded, then move on." Always restless, Oberst also looked for a change of scenery to make the new record. On a tip from friends, he traveled to Cuernavaca, Mexico where he set up a makeshift studio in a villa called VAlle Mistico (Mystic Valley). Guitarists Taylor Hollingsworth and Nik Freitas, bassist Macey Taylor, keyboardist and trumpeter Nate Walcott, and drummer Jason Boesel joined Oberst for the project, naming themselves the Mystic Valley Band after the recording location. All except Hollingsworth have played with Oberst before in Bright Eyes.